Diospyros celebica from the Celebes islands. 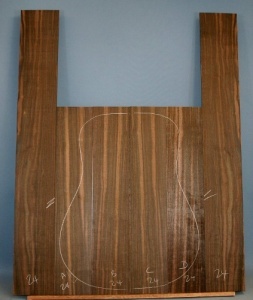 Photo is of Macassar ebony set number 24. The most desirable figured ebony species beloved by art deco designers. Stable and virtuous as a guitar builder’s wood.Genuine Macassar ebony is scarce and lumber sizes are quite small. 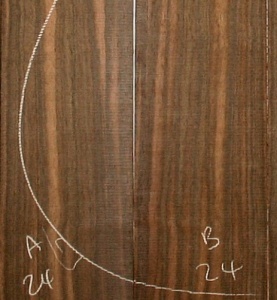 Guitar sets are possible with 3 or 4 piece backs only. full western size with 4 piece back.